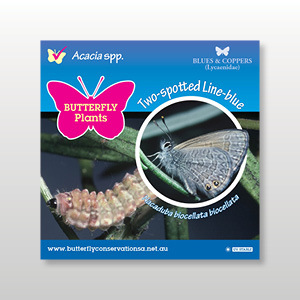 Plant tag for Two-spotted Line-blue (Nacaduba biocellata biocellata). Includes plastic stake. These durable and waterproof plant tags will inform you and your visitors about the link between habitat and our beautiful butterflies. These tags are now printed with UV stable ink to ensure they are durable.